The winners of the Ultimate Backyard Makeover have been chosen, the work completed (during one of the hottest weeks of the year) and the fanfare has already died down. The transformation of the yard from dust bowl to oasis was pretty incredible! Historic Shed was honored to be a part of the process and amazed at the dedication of contest organizers, Lisa and David Burns of Backyard Getaway. Historic Shed participated by building and delivering a custom 4’x4′ shed as part of the contest. 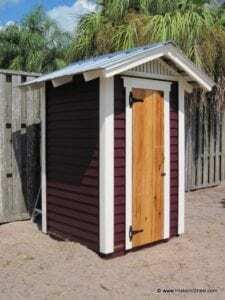 The little shed has wood siding, a metal roof and a cypress door. While small, it will be perfect for storing lawn tools or yard games (the winners are fond of playing horseshoes). It was painted a deep burgundy to complement the planned color for the winner’s front door (now that the yard is done, they plan to move on to house painting). To see the project from start to finish, check out this video on WQ Mag.